Sadly, Japanese beetles are back for another summer of mayhem. As you consider your pest management options, remember that the damage Japanese beetles cause is primarily cosmetic, affecting the appearance of plants but usually not the health of them. However, if trees are young, recently transplanted or are already under stress, it is a good idea to protect them from any additional damage. It is important to keep on top of Japanese beetles; as the first beetles feed, the damaged leaves put out a chemical volatile that attracts more beetles. 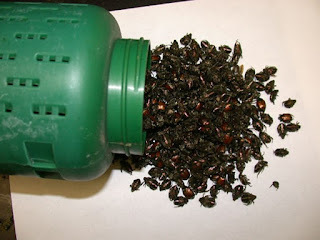 The better you can minimize beetle feeding at the start, the more slowly it will take the beetles to cause damage. If there are not many Japanese beetles in your area, you may be able to avoid much damage. However, if you are in area that saw large numbers of these beetles in 2017, they are likely to be at least as numerous again this year. There is a variety of options for managing Japanese beetles, use as many as possible to improve your chances of keeping Japanese beetle feeding to tolerable levels. Also, be realistic about what you can actually accomplish against these pests. If you have a small garden, physical removal can be a good option, especially when only small numbers are present. However when Japanese beetles are numerous, it becomes impractical to handpick them every day. Another non-chemical option is to place a cheese-cloth, or similar type of fabric, around valued plants to exclude the beetles. However, if you have blooming flowers that bees want to visit, don’t use exclusion. Although popular, the use of traps is not effective. While these traps can capture an impressive number of beetles, the traps are attracting more Japanese beetles than they catch. Research has shown that when these traps are used in home gardens, damage is not reduced but in fact is likely to increase. There are a few low risk insecticides available. Pyola is effective but this product is short-lived and repeat applications are necessary. Neem oil is also an option. It helps deter Japanese beetles but is less effective when large numbers are present. Both of these products can be toxic to pollinators so be sure to apply them when bees are not active. A relatively new product available for Japanese beetles is Bacillus thuringiensis subsp. galleriae, sold as beetleGone or beetleJus. This product also has some activity against butterfly and moth caterpillars so should not be used in butterfly gardens. There is a variety of residual insecticides that you can use, like permethrin or carbaryl (Sevin). Depending on the product, an application can be effective up to several weeks so repeat applications may be necessary. To protect bees, apply insecticides during late evening after bees are no longer active. The insecticides should be dry by morning when bees become active again. If you are trying to protect a large tree, you may need to have it treated by a landscape or tree care company. Sometimes, especially with trees, the best method of treatment may be a systemic insecticide. Common systemic insecticides are imidacloprid and dinotefuran, both neonicotinoids. Only one application is necessary for each season. However, these insecticides are toxic to bees so either wait until the plants are done blooming (which probably already happened earlier this spring) or don’t use them on bee-attractive plants at all. Neither insecticide can be applied to linden or other Tilia species. Also, keep in mind that it takes time for the insecticide to move completely into all parts of a tree. While dinotefuran works relatively quickly, up to a couple of weeks, imidacloprid can take three to five weeks to move throughout the tree. There are a couple of other systemic insecticides that can also be used to protect trees, including linden. Chlorantraniliprole (Acelepryn) is very effective against Japanese beetles and is a low risk product towards bees. It has season long control and is taken up by relatively quickly by trees. Acelepryn is available for application through licensed applicators. Another systemic insecticide that is effective against Japanese beetles is acephate, used commercially as Lepitech. Lepitech it taken up by trees in days and lasts about one month so more than one application might be needed. While toxic to bees, it breaks down quickly so it I should not be an issue to pollinators next year. Lepitech is also only available through licensed applicators.